STEINER, NEWMAN LEOPOLD (he signed his marriage return Neuman Leo), artisan, businessman, jp, and politician; b. either on 10 Dec. 1829 or in 1832 in Dachau (Germany), son of Wolfgang Steiner and Francisca Rothshild; m. 22 Feb. 1876 Bertha Sternberger in New York City, and they had four sons, one of whom died an infant, and two daughters; d. 5 Jan. 1903 in Toronto. Newman Leopold Steiner was born to a Jewish family in Bavaria, the 11th of 14 children of a government contractor. In the course of his education in Vienna, he joined the Hungarian revolutionists under Lajos Kossuth in 1848. During his eight months of service he was wounded and jailed by the Austrian government. After the failure of the revolution he came to America, trained for three years as a stone sculptor in New York, and moved to Toronto on 6 Oct. 1852. Steiner carried on business as N. L. Steiner Marble Works from the time of his arrival to his retirement in 1886. During that period he supplied the marble for many buildings in Toronto as well as for gravestones throughout the area. His work included services as a master craftsman. He chiselled the official crest above the main door of University College during its construction (1856–59), for example, and was responsible for executing the inscriptions on monuments supplied by his firm, most of which he signed with his initials. Tombstones and plaques so inscribed have been found in the cemeteries of Little Trinity and St Andrew’s churches (Toronto), St George’s (Sibbalds Point), and St Mark’s (Niagara-on-the-Lake). In 1870 Steiner was commissioned a justice of the peace, the second Jew in Ontario to receive the honour, first bestowed on George Benjamin* of Belleville in 1857. Ten years later he was elected as an alderman for St James’ Ward, polling the largest vote yet received by a Toronto alderman. Re-elected in 1881, he stepped down the following year but ran again successfully in 1883, 1884, 1885, and 1886, heading the poll each time. In 1884 he officiated at the city’s semi-centennial celebrations. Though Steiner apparently was not a major participant in council debates, he spoke out in 1886 over a proposed reduction in liquor licences. His alliance with reform mayor William Holmes Howland* ended abruptly when Steiner claimed, reasonably, that cuts would only lead to more unlicensed outlets and infractions. Defeated in 1889, he re-entered public life ten years later as an alderman for Ward 3. He was considered the “father of the Council” during his aldermanic career. Although Steiner is remembered as Toronto’s first Jewish alderman, his main affiliations were with St John’s Lodge in the masonic order, of which he was master for a time, and the German Benevolent Society, of which he was founder and first president in the early 1870s. Steiner’s connection with Toronto’s small Jewish community appears to have been broken by early 1877. He had married in a Jewish ceremony in February 1876 the daughter of a renowned cantor at one of New York’s synagogues. There is evidence that he had some association with Toronto’s Holy Blossom congregation: his name appeared on a list, dated July 1877, of people at Holy Blossom “desirous of establishing a charitable society.” In January of that year, however, when the Steiners’ first child, Walter L., died at the age of only 13 days (possibly before he had been circumcised, which Jewish custom normally required at 8 days), the couple made a decision to bury him in the public Necropolis rather than in Holy Blossom’s cemetery on Pape Avenue. The reasons for this decision may well have had roots in a clash between the traditional practices of Holy Blossom and Bertha Steiner’s Reform background as a follower of Rabbi David Einhorn, the leader of extreme radicalism among American Jewish congregations. The Steiners had severed connections with their faith by the summer of 1882, when they purchased a plot in non-denominational Mount Pleasant Cemetery, and had their child’s remains reinterred there. Within the next few years members of the family joined the Unitarian Church in Toronto, although Steiner himself did not. 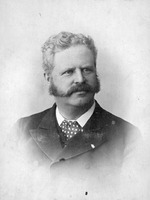 When he died in 1903, Steiner was survived by his wife and five children. The funeral was conducted by his masonic lodge and by the Reverend Jabez Thomas Sunderland of the Jarvis Street Unitarian Church. AO, RG 53, ser.21, vol.1, 3 Aug. 1877. Holy Blossom Temple Arch. (Toronto), “List of persons desirous of establishing a charitable society, Toronto, July, 1877.” Mount Pleasant Cemetery (Toronto), Burial records and tombstone inscription, triangle 8. New York City, Dept. of Records and Information Services, Div. of Municipal Arch., Geneal. coll., vital records, Certificate and return of marriage, 22 Feb. 1867. Private arch., Florence Blackwell (Toronto), Steiner family records. S. J. Birnbaum, “The history of the Jews in Toronto,” Canadian Jewish Times (Montreal), 10 Jan. 1913: 12. Daily Mail and Empire, 6 Jan. 1903. Globe, 7 Jan. 1903: 12. Toronto Daily Star, 7 Jan. 1903: 6. Hist. of Toronto, 2: 154. W. J. Loudon, Studies of student life (8v., [Toronto], 1923–[4–? ]), 5: 226–27. Desmond Morton, Mayor Howland: the citizens’ candidate (Toronto, 1973). S. A. Speisman, The Jews of Toronto: a history to 1937 (Toronto, 1979). Toronto, City Council, Minutes of proc., 1880, app. : 5; 1881, app. : 15; 1883, app. : 11; 1884, app. : 8; 1885, app. : 13; 1886, app. : 11; 1889, app. : 30; 1899, app., election returns for Ward 3; 1902: 226. Sheldon J. Godfrey, “STEINER, NEWMAN LEOPOLD,” in Dictionary of Canadian Biography, vol. 13, University of Toronto/Université Laval, 2003–, accessed April 24, 2019, http://www.biographi.ca/en/bio/steiner_newman_leopold_13E.html.